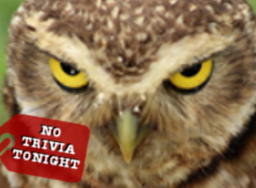 There will be no trivia tonight (2.3), as there are some superb owls who want to watch a sports and/or advertisements and/or a musical act and/or puppies. Trivia will return to normal as scheduled tomorrow. For a full list of our venues, click here. Also, while you're here - be sure to listen to the Sunday venues and follow us on Instagram.